Here is another good blog to check out if you like Training with Power. 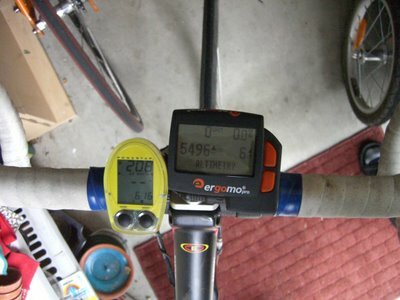 Today I rode with an Ergomo and my Garmin 301 in order to check the altitude on the Ergomo unit. It seems the Ergomo reads 500ft lower than the Garmin. I now need to re-calibrate the Ergomo. I set another new record today with my highest CP90 of 2006 at 280w! Plus yet another 8,000+ft day of climbing! Very cool. 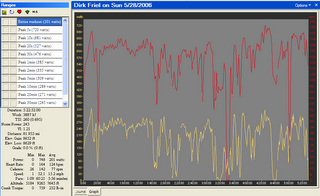 These maps and graphs show my altitude gain on the day. I Rode up Magnolia to meet Steve and Jim at Coal Creek Canyon and Peak to Peak Highway by 9:30am. I left my place at 8am so I had to pretty much time trial up Magnolia to get to the meeting place on time. 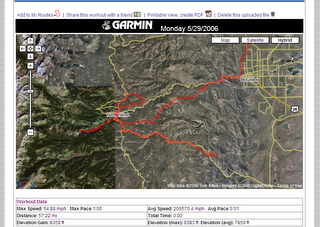 Once with Steve and Jim we rode to Eldora, then did Cold Spring road and back up to Steve's house. Great ride especially since it ended at Steve's with cold beer and a burger! Wow, this week ended up being my long-lost base period I've been lacking in '06. My hours aren't the biggest (13.5hrs this week/largest was 17hrs) but my Training Stress Score (TSS) for the week is my highest for 2006 because I did five days of big climbs this week. 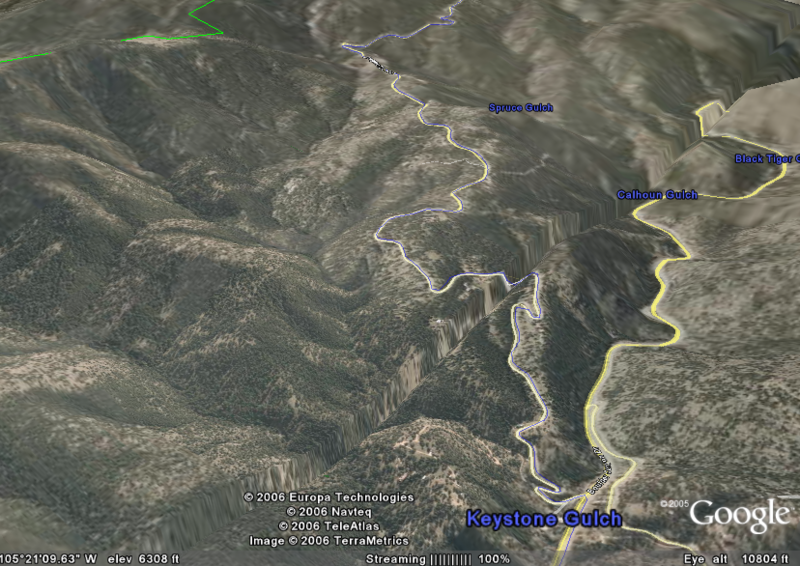 Today I did 5.5hrs and climbed a total of 8600ft, which was my biggest ride of the year. My highest TSS score prior to this week was 577 set in mid-April. This week ended up being a TSS of 671 and 9408 kj's. 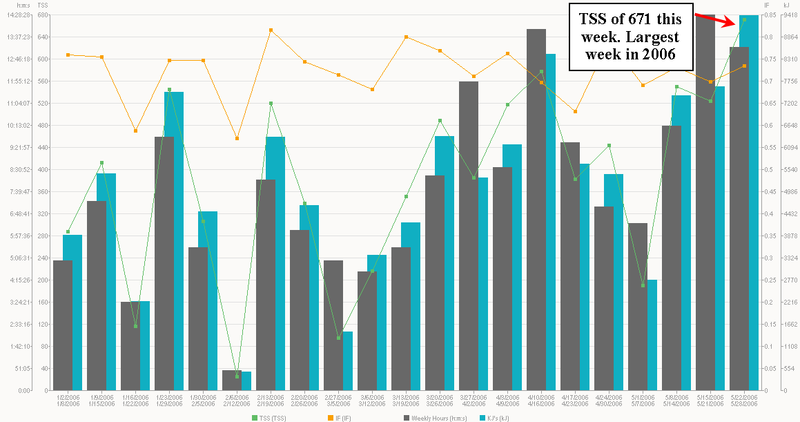 Take a look at the WKO+ screen shot of my weekly Hours, KJ's, TSS and IF for 2006. 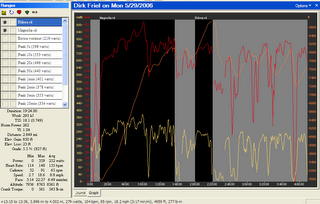 I've actually had a pretty nice periodized program as you can see, even though I didn't plan it that way. 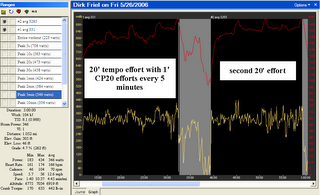 Also take a look at Friday's file which included 2 x 20' tempo efforts and I injected an hard CP20 effort every 5'. My intent in doing this workout was to build up more muscular endurance since I haven't done any real structured ME work since about February. This could be an issue entering the summer race season when I hit the local road races. There is no hiding when to the climbing races and of course I want to do the best I can on my limited weekly training hours. 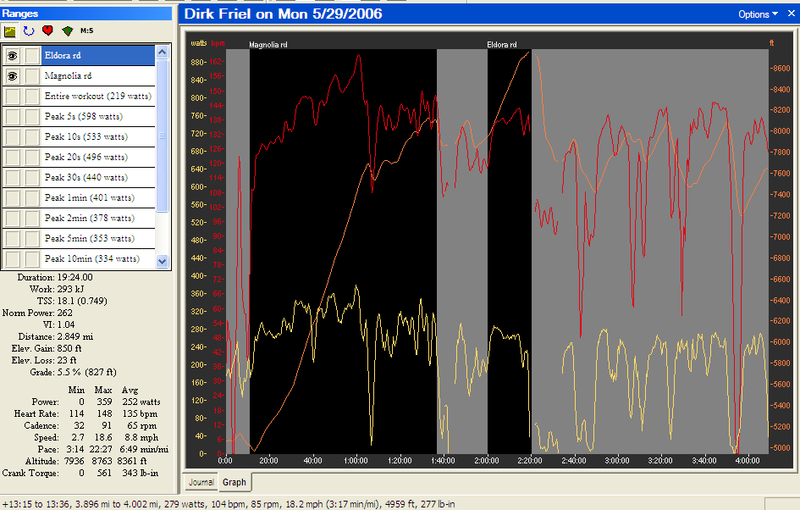 This week of training may really help the second half of my season and really bump up my aerobic fitness. I know it isn't that big of a week as compared to most Cat 1/Pro ridersbut when you are mainly used to only doing 90 minute rides it doesn't take many long rides to bump up the form. Fingers are crossed and we'll see how the road races go the second half of the season. Today's ride was epic. 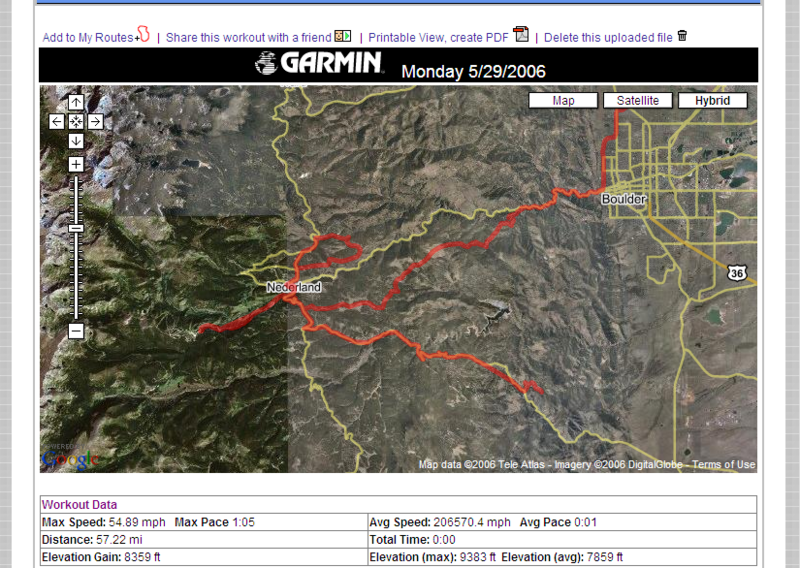 5.5hrs(take a look at the screen shot), 81 miles, 3887kj, 260 TSS, 8600ft of elevation I rode about 30 miles on steep dirt rodes some of which are still closed for the winter. It is rides like this that keep me going mentally for another 6 months. I love exploring the mountains and trails around Boulder and can't believe I am still finding new roads after training here for eleven years. I didn't even get to the top of some of the roads today such as Caribou road and Ranbow Lakes Road. These are some amazing dirt roads up above 9,000ft and have the world's best views of the rocky mouintains. Well that's it for now. I have hopes of one more long mountain ride tomorrow if I can swing it. My wife and I have plans to visit friends at a BBQ in the mountains tomorrow and I may be able to ride up to the party. Fingers are crossed! What a finish! Sam Hornish beat 19 year old Marco Andretti in a sprint to win the 90th edition of the Indy 500! 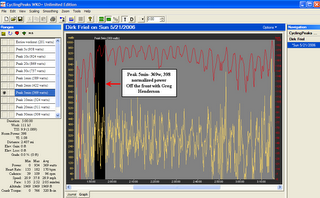 Sam uses TrainingPeaks.com through his coach Jim Leo of PitFit Training to manage his physical training. Great job Sam. Today is the last climb of the Giro which is bit sad. love watching this stuff every morning. Someday I have to get over to watch the Giro in person. Last year Gear and I followed the Tour and camped out most nights under the stars on Category 1 and HC climbs. That was a dream vacation. If you didn't see it Ulrich dropped out yesterday and Basso is untouchable. The Tour will be an amazing race this year. 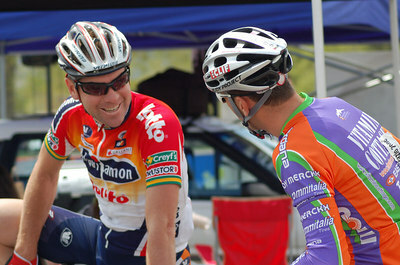 Here is a good post by Matt Allen who has been racing in Belgium since March with the CyclingCenter.com program. Bernard Moerman has created a great program to help young riders develop and learn how to race in Europe. Two of my Vitamin Cottage teammates, Scott Tietzel and Peter Horn also race part of the season in Europe with the CC program. Bernard's program is a heck of a lot better than when I headed over to Europe at age 19 in 1990. These guys today have wifi, hot water and central heat! During those early years we used to race to be the first person to the dinner table in order to be the closest to the space heater. And in terms of communications we used to call home once a month for about five minutes. These guys today can call home for free through Skype.com! I do owe a great amount to my best Belgian friend Pierre Hans who saw my talent back then and helped me along in my five years in Europe. I pretty much owe Pierre for my first pro contract and keeping on the path to success. Pierre will be here in the states working for Barloworld at the upcoming Philly week and I believe it will be his first time ever in the US. Anyways just being a little nostalgic today and thought I'd pass it along. 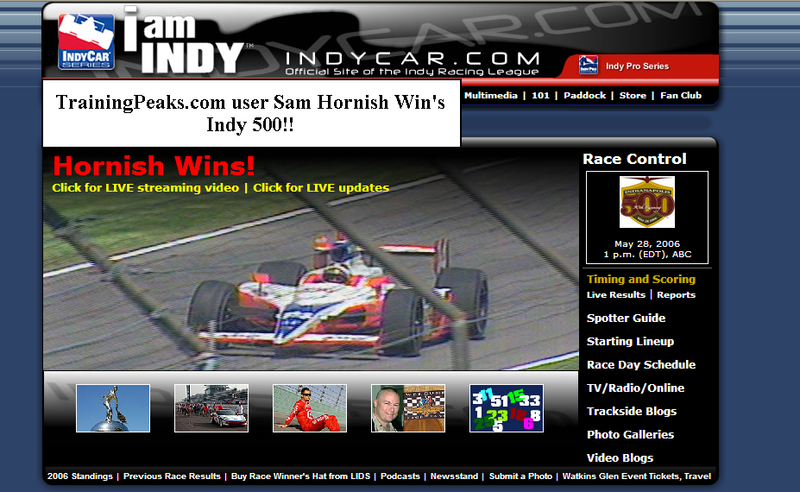 TrainingPeaks.com (http://www.trainingpeaks.com), the leading provider of online training technology is helping tune the internal engine of Indy Racing League’s Sam Hornish Jr. as he secures the poll position at the Indianapolis 500. Leo also said it makes sense that today’s top drivers take advantage of the latest technology in fitness training. The software programs provided by TrainingPeaks.com in conjunction with the training schedules provided by the PitFit Training staff have already proved to be a winning combination for PitFit clients. Hornish qualified for the poll position by setting a four-lap average of 228.9 mph and survived, with no injuries, a crash into the wall during Sunday's training session. Training Peaks, LLC develops and maintains http://www.TrainingPeaks.com The Endurance Operating System for Athletes, Coaches and Active Lifestyle Participants. PitFit Training http://www.PitFit.com, develops driver-specific fitness, nutrition and human-performance programs to expressly address the physical and mental demands of the motorsports industry. Contact: Jim Leo, President, 317-388-1000. Vogels 4th in today's Giro stage 15. I wasn't even sure if Henk survived the mountauin stages this past weekend but it looks like he not only survived them but came out with pretty good legs. Highest CP60 of the year! 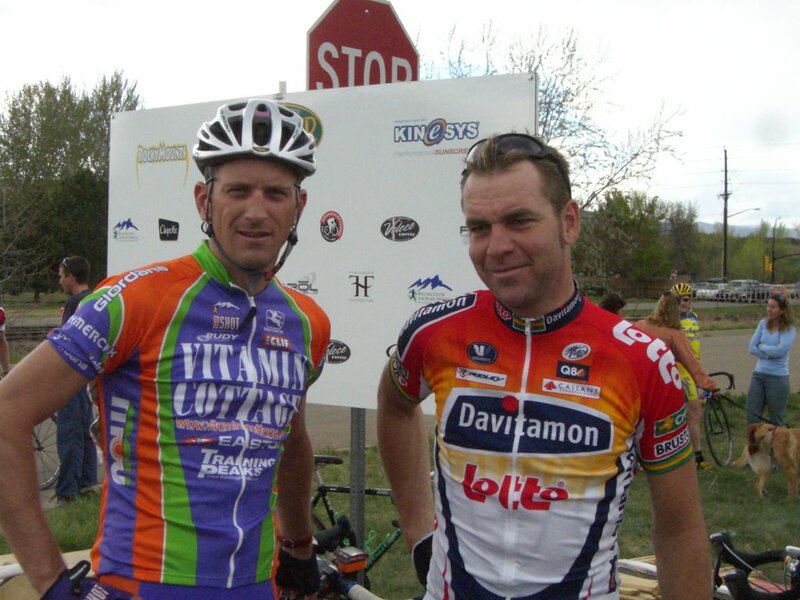 Yesterday I raced the Coal Miner's Classic in Louisville, CO. 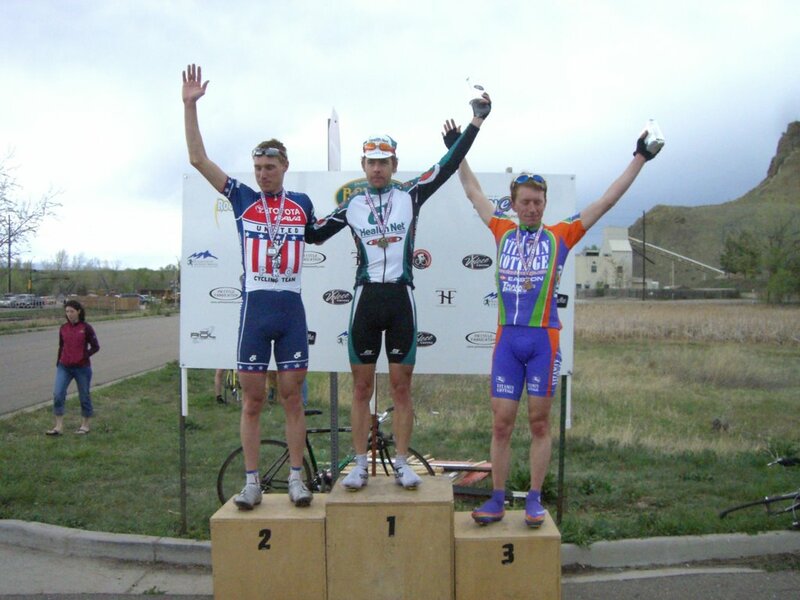 This is always one of the top 3 hardest races on the Colorado calendar and yesterday was certainly no exception. The course is about one mile long with the finish straight being a quarter mile long at a 6% grade. This is the kind of hill that zaps your legs because it isn't quite a small chain ring climb and about 30 minutes into it you wish you could bale out and watch from the sidelines. I was wishing I could pull out within the first three laps this year however. It was 90 degrees and we set a hightemperaturee record for the day. Then on the 2nd lap Greg Henderson (Health Net world track champion) attacked and I had a farely simple decision to make..Do I let him roll away and win or do I at least go with him and give a good fight to try and stay with him? Well I'm never one to give in so of course I followed his wheel and one other went with me. The outcome was worse that I could ever have imagined. Greg was so strong we couldn't even pull through. When I did come through it was for about ten seconds and our speed would drop dramatically. On the climb I sat on hsi wheel at 20 watts and he wa staking it easy on me. I sat on him for the better part of 10 laps until he finally just rode away from us. At that point we had a 25 second advanatge on the field and I was hoping I could get caught by the group, take a brief rest and then go to the front to help my Vitamin Cottage teammates chase Greg down. Well what ended up happening of course was a flurry of attacks started after I was reeled in and my teammates did an excellent job of stacking the odds in our favor to hopefully get 2nd place. Jon tarkington, Chuck Coyle and Christian McCarthy made the chase groups and I was left in the back sprinting for 10th place. By this time Greg had build up a 50 second lead as his "dead weight" was gone and he was free to go as fast as he wanted. That is the worste I have been dropped in about 2 years, but at least it was to a super fast guy (although on injured reserve after breaking his hip a few months ago :( . This was my highest CP60 of the year at 295avg watts and 330 normalized power. Hopefully that amount of suffering only made me a stronger rider though. Thanks again to my teammate Jon Tarkington for saving the day at getting 2nd place yesterday. The post race interviews are almost better than the race itself as you get to see the riders personalities. Often times they conduct the interviews in multiple languages including english so don't be scared of the Italian flare. It looks like Henk's time in Colorado last didn't hurt him at all. 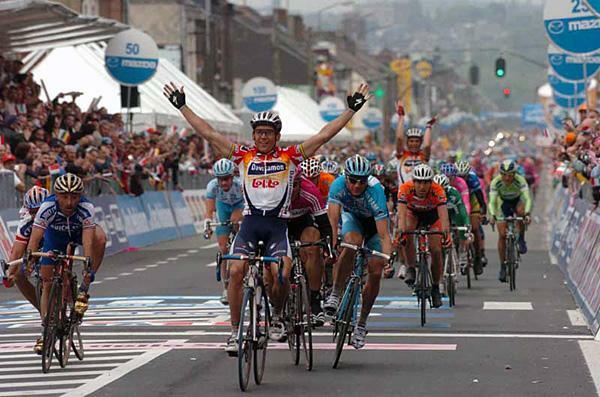 Notice Henk about ten guys back applauding McEwen's efforts. Sweet ride guys. CHEERS! Vogel's on the front in Giro Stage 1- 30k to go....Watch it live here. Live Giro d'Italia TV on the net. This is direct Italian TV on the web. If the link above doesn't work go to www.media.rai.it and then select the "Sport" tab to view live and archived stages. You just have to click on 'Train with Chuck' "
Cool Podcast by Chuck which was recorded Wednesday at the Tour of the Gila. 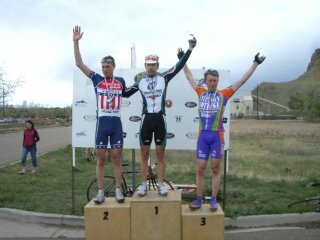 By the way great job to Peter Horn getting 4th yesteday in the Cat 2's. Nice ride Pete especially flying in from NY up to altitude! Man I don't deserve this type of credit. It was nice to be mentioned in the same sentence as Vogels...Even if it was a jab a my sprinting ability:) Thanks Neal. So I'm turning into a geek, but at least I'm a fit geek. 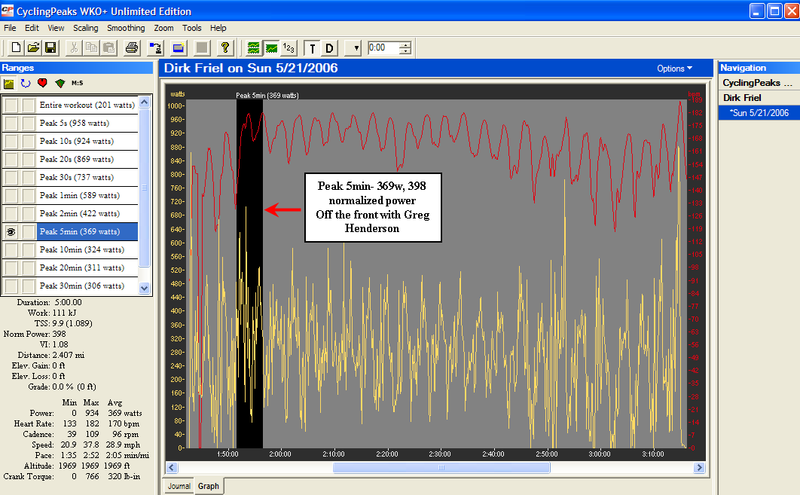 The tempation to wire my bike with $2500 worth of power meter equipment was just too hard to overcome. It was even raining out and I went and did this just to show you how much I wanted to compare the devices.. I headed up Linden Drive in North Boulder and did 5 x 3' at my CP6 (@400w) with 3' recoveries. I ended up watching the Power-Tap more than the Ergomo because it was reading higher (but not too much as you'll see below). I'll mainly let the data speak for itself..
#5-394: 386 8 (Ergomo high) Very st range.. why would only one interval register high???? 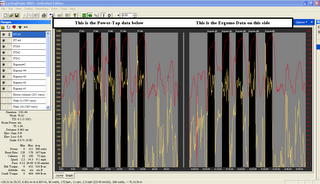 Here is a screen shot of CyclingPeaks with the two files lined up back to back and the intervals highlighted. After all is said and done the Power-Tap obviously reads higher for me almost across the board, but not by much and certainly within reason. I'd rather go with the hgher numbers but this year I'll be racing with the Ergomo for the first time in seven years of using a power meter. Henk Vogels was in town last week preparing for the Giro and lucky for us he showed up to our local Stazio criterium (to make us all suffer just a bit more). This photo was taken after the race ad he is looking pretty fresh wouldn't you say? Good luck to Henk in Italy. He almost won a stage last year. 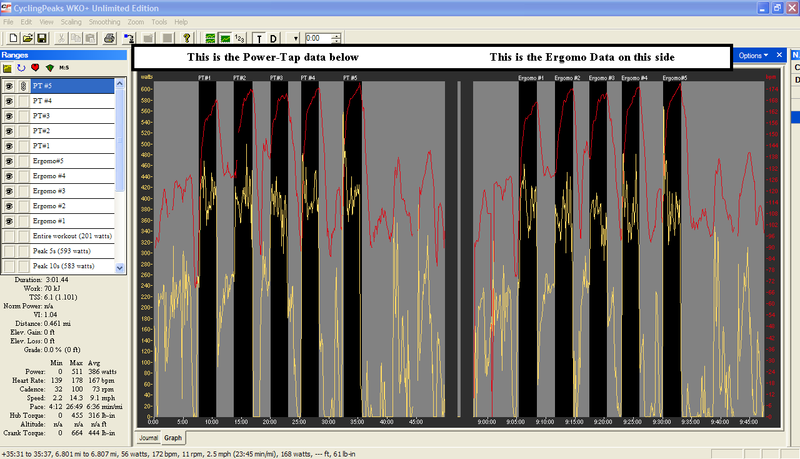 Here is my Ergomo power file from the race shown within Cycling Peaks. 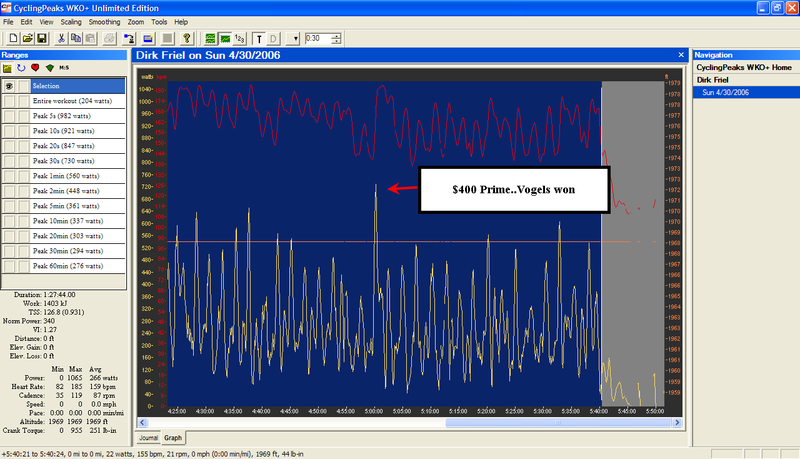 Notice the huge spike in the middle where we had a $400 prime, which Henk won.